Sunday was my birthday. Even though the number puts me unequivocally well into my late 30s, I looked forward to the turnover. 37 was not my best year. 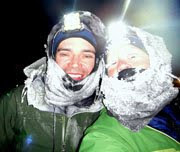 Autumn and winter brought a descent into increasingly poor health and fitness as I desperately tried to train for the most daunting adventure I had ever planned to attempt, the Iditarod Trial Southern Route to Nome. The harder I pushed, the worse I felt ... but the sensation was something more insidious than fatigue or burnout. It felt as though I was being smothered from the inside out. Desperation kept me (relatively) quiet about my deteriorating stoke, but I genuinely hated how I felt during some of these training efforts, and hated that I was starting to hate adventure. In February, I was diagnosed with an incurable autoimmune thyroid disease that forced me to withdraw from the race, which I considered walking away from a potentially once-in-a-lifetime opportunity. In March, while snowshoeing in Juneau, I was caught in an avalanche (which I gratefully walked away from.) Spring brought the physical rollercoaster and an understanding that, no matter what, things are never going to be quite the same. In June, feeling wildly optimistic, I DNF'd the only ultra I attempted this year, the Bryce 100. Such failures always hit the ego hard, and I spent most of July believing I'd always be (relatively) enfeebled. In August, my outlook noticeably improved — independent of anything happening in my life and despite the timing. August is usually my least favorite month. This one was cool and green and full of wildflowers. I felt jazzed about the tiniest moments, like viewing the soft morning light over Eldorado Mountain when I had to take out the trash on Thursday morning. As I told my sister, it feels as though this dreary fog had slowly enveloped me over the past two years, and now it's beginning to fade. The gray pall cast over my thoughts and emotions is brightening. If I could stay on this mental upswing, I'd embrace whatever physical limitations had to follow. Happily, my physical health is back on the right track as well. If I could choose anything in the world to do on my birthday, high on that list would be "climb Lone Peak with my dad." Lone Peak is a 11,253-foot summit in the Wasatch Mountains. I consider it my "home" mountain. I grew up in its morning shadow; the peak is less than five miles due east from my childhood home — and 7,000 feet higher. 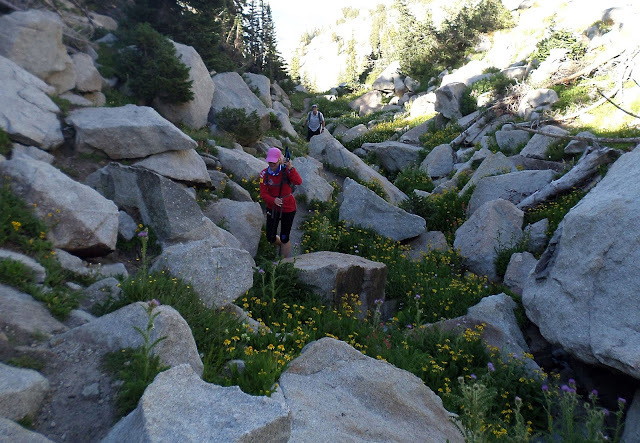 As a hike, it's considered by many to be the most difficult standard route to a summit in the Wasatch, rising 6,000 feet in six miles along a chunder-filled gully of a trail called Jacob's Ladder, followed by boulder-hopping in a granite cirque, and finally a class-3 to low-4 scramble up a narrow ridge of vertically-stacked monzonite slabs. I don't quite remember the first time my dad guided me to this peak. I believe it was the summer after I graduated from high school, 20 years ago. 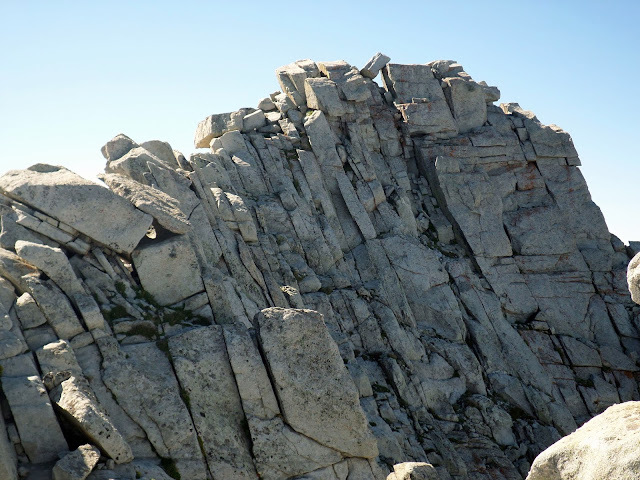 My early memories of Lone Peak's difficulty all surround the steep slog of Jacob's Ladder. There are fewer memories of the slabs that bother me today ... probably because I have 20 years of physical conditioning behind me now, and also two decades of risk and personal ability assessment, which have made me much more wary of exposed scrambling. 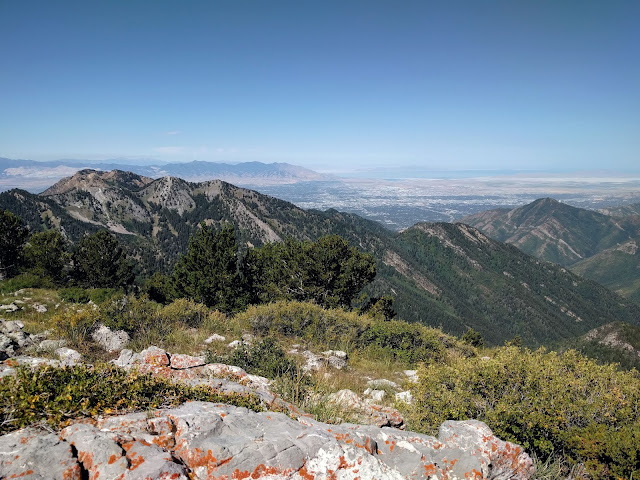 Much sharper than memories of difficulty are memories of amazement and joy — the quiet Alpine forest mere miles from my crowded suburban neighborhood, the sheer granite walls above the cirque, and standing on top of a peak barely as wide as I am tall, overlooking the entire Salt Lake Valley. My unplanned trip to Utah for my aunt's funeral just happened to put me in position for a 20th anniversary/38th birthday visit to what is still my favorite mountain. Dad was available, and we also were joined by his friend Tom. Dad had Sunday afternoon obligations so we left at the crack of dawn, enjoying clear skies and temperatures just below 70 degrees. My legs retained a dull soreness from Friday's 14er adventure, but for the most part I felt fantastic. We made quick work of Jacob's Ladder and practically bounded through the wildflower-filled cirque. Dad is in incredible shape and I couldn't quite keep up with him, but I came as close as I could hope to. There was so much oxygen up there, at 10,000 feet. 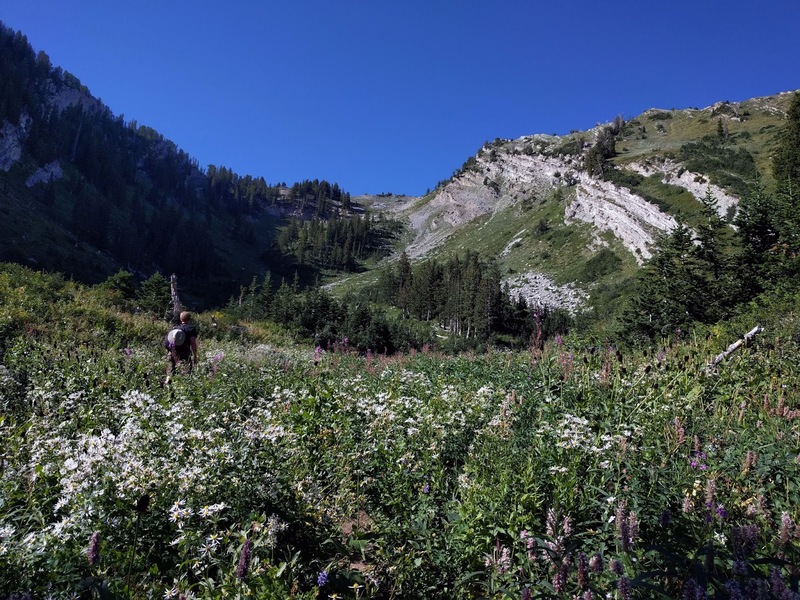 When we reached the base of the peak, Tom decided to stop and take a nap in wildflower-filled meadow. Dad and I scrambled up a steep and tricky gully — boulders covered in sand — and continued onto the ridge. This photo that my dad took gives an idea of what the summit ridge is like. It's difficult to depict the scale, but the peak is only about 15 square feet. The tilted slab leading to the peak is about five feet long, and not nearly as wide as I'd like. 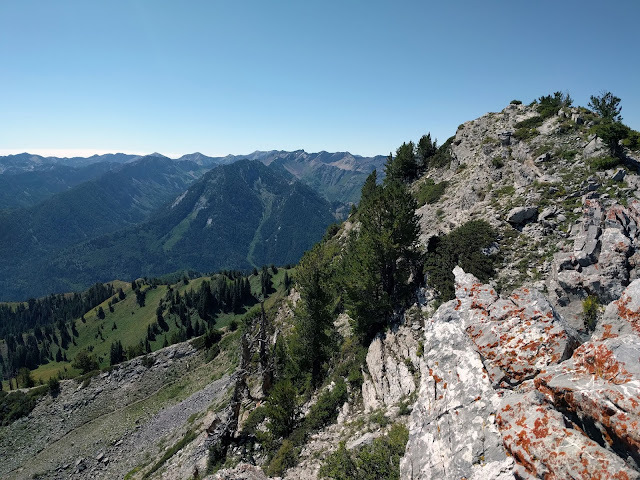 A tumble from this ridge might bounce you on a couple of earlier boulders, but you'd probably land in the cirque, nearly a thousand feet below. I pulled out my camera to take a photo dad scrambling up one of the first short class-4 maneuvers, and caught an rush of vertigo. 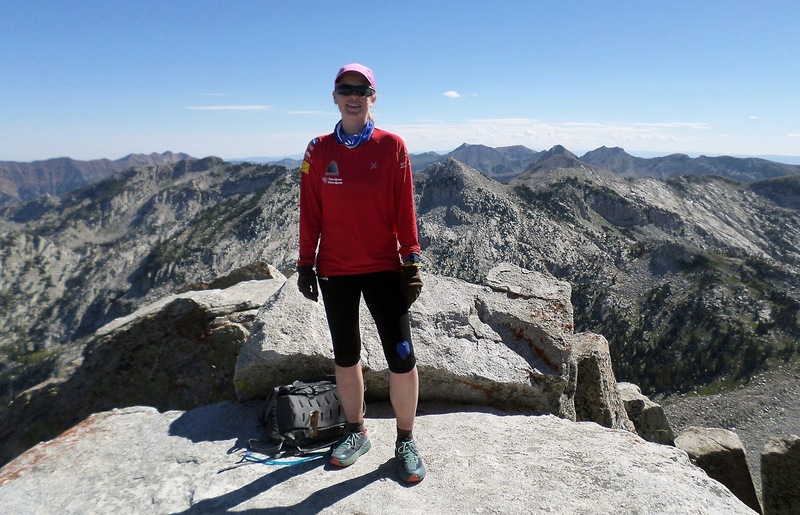 It was similar to the sensation that I battled after rolling my ankle and tumbling onto my head on Grizzly Peak on Friday — the sensation that just wouldn't go away and effectively frightened me off the mountain ridge after I summited Grays. Again I felt dizzy, then began to teeter, panicked, and dropped the camera. It bounced once on the edge of a narrow precipice and disappeared into a seemingly bottomless crevasse. My dad and I both wedged ourselves into cracks underneath car-sized boulders, scanning dark hollows for signs of a small, black object. It was nowhere to be seen. Gone. I don't know what made me more sad — that I'd lost my $500 camera (which was several years old and very well used), or that I'd lost all of my images from Lone Peak. It had been such a gorgeous morning. My camera was gone but the vertigo persisted. Watching an object bounce and rocks and disappear did not help the sensation that gravity was yanking me in every impossible direction. If Dad hadn't been there, I would have undoubtedly lost my nerve. He patiently coached me through the monzonite puzzle, pointing out the best handholds, warning me about slippery sandy sections, and even pulling me up by the arm up a ten-foot slab when my shoulders went weak while gripping a tiny handhold. Finally we were on the peak, perched next to thousand-foot drops in three directions, nibbling on Nutella-slathered pita bread. I was happy, but still ill with unsteadiness. Looking back on the perhaps half-dozen times I've sat on the kitchen-table-sized summit, I remembered that I pretty much always feel this way on Lone Peak — like the cirque is rushing toward me, and if I stand up, I might collapse. I probably felt this way the first time, even when my 18-year-old ignorance of innate clumsiness was there to protect me. Vertigo is not exactly an enjoyable sensation, and yet I've loved Lone Peak ever since. I used to joke with friends that I was never going to get married, but if I did, it would be on top of Lone Peak (Technically I still haven't broken that promise.) I suppose dizziness and stomach butterflies and exhilaration are exactly the sensations of love. Twenty years and countless mountains later, Lone is still my favorite. I had birthday dinner with my parents and sister's family. It was just like old times — grilled salmon and vegetables with corn on the cob from the same local farmer, and mom baked a German chocolate cake for dessert. It was a great birthday ... hopefully that means it's going to be a great year. On Monday I needed to drive back to Colorado. 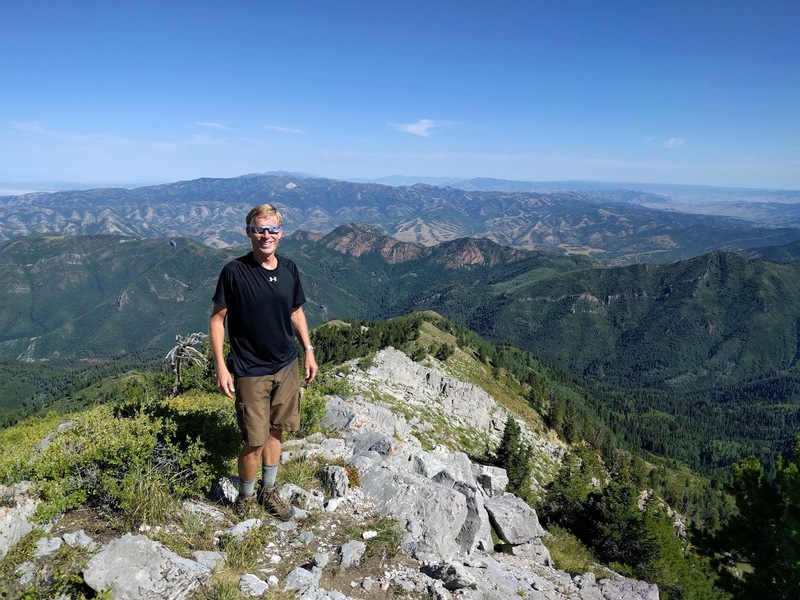 Although I wanted to beat all the of the eclipse traffic heading south from Idaho and Wyoming, it was too much of a temptation to stay in Utah through the early afternoon and view the partial eclipse from a mountain top. I'm one of those who wasn't that interested in the eclipse until recently ... I even had an invite from friends to go camping in Wyoming during the total eclipse, and shrugged it off. (I thought I'd be too busy wrapping up some deadlines before leaving for Europe this week. At the time I didn't have plans to be in Utah.) But then I fell victim to the hype, and decided to join dad on another tough hike to a 10,000-foot mountain called Gobbler's Knob. My legs were definitely aching as we ascended 3,000 feet in 2.5 miles. Dad didn't seem any worse for the wear. We arrived at the summit 50 minutes before the eclipse at its fullest — I believe around 92 percent. I don't think I've ever spent more than an hour sitting on a mountain top, and really enjoyed the relaxed lounging, watching a strange early twilight descend over the surrounding mountains and valleys, and occasionally donning the eclipse glasses to watch the moon take increasingly larger bites out of the sun. No doubt the total eclipse would have been incredible. But this was special as well — looking up at the crescent sun, feeling a chill descend and putting on a jacket, watching birds bounce nervously across tree branches, and absorbing a silence that seemed to deepen as the sun nearly disappeared. We descended the mountain quickly, as I was still hoping to beat I-15 traffic. I thought about the ways I appreciate getting older, because each day lived adds to a wealth of experiences and memories, and a deepening of perspective. I envied Dad's limber movements down the steep trail, and hoped that one day I can be 64 the way he's 64. He's had some rough patches in life, and emerged stronger, possibly as strong as he's been. For now I'm 38 the way I can be 38, seeking strength where I can find it, and excited about the year in front of me. Good to hear of your trip - please keep fighting to run/walk/bike, there are more people regarding your work in terms of their own health than you perhaps realise. If you can keep battering away at the various barriers your body and mind are throwing up, so can we. And if you can continue to be honest about the pain and fear, it makes a huge difference. Thank you. Happy birthday and may your 38th year be all that you want it to be. Happy birthday Jill. Best wishes for a healthier and less stressful year ahead. I look forward to reading of this year's European adventures. Happy birthday Jill - what a great couple of hikes to kick the year off right. We should all spend birthdays this way. Happy happy!